i still keeping it after all this. too many things to do..
SPM is around the corner. and WTH am i doing now. Brain full with rubbish that should be cleared up earlier. someone told me, if u are waiting for someone’s love. use the time to love yourself more.!! sometimes, guys had their problems too. maybe they just not good in explaining or whatsoever. Trust them if you think he worth it. or else, dump it a side and don’t let it affect you. I don’t like you being moody. 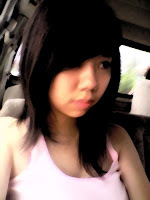 i KNOW that guys are actually more selfish and angry more easily than we gals at times. They can even pretend damm well as if they really will like us as what they promised. I’m pissed of it too. But what can we do. hmm.. just chill and hope that things turn out as what we expect. 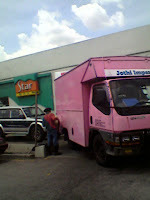 I super excited when i saw this pink lorry..
i bet i will be happy this whole day..
this is some ways that might made you happier sometimes.